What Is The Best Magnets And Rope For Magnet Fishing? ​You have heard about magnet fishing and want to try it, but which magnet fishing magnets should you buy, and which rope is the best for magnet fishing? On this page you can get all the answers, and luckily magnet fishing is not an expensive hobby. You only need two things to have the basics. ​​The other thing you need is rope. Rope for magnet fishing has to have a tensile strength of at least the same as your magnet. Are You From The Magnet Fishing UK Community, Click Here! 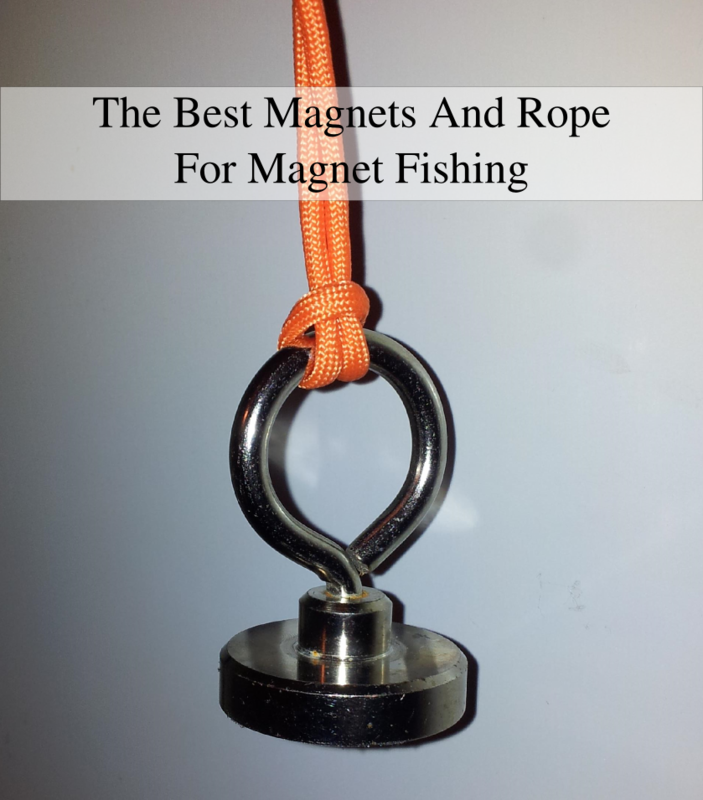 To get more information about the magnets, the rope and my current 390 kg/860 lbs strong magnet rig, continue to read on this page, otherwise you might want to see my best catches here or you can join my Facebook group and share your own catches here. You need a strong magnet you are able to attach the rope to. I did the beginner mistake and thought that a 110 lbs / 50 kg magnet was more than enough to start with. To be honest, it couldn't lift that much and I lost many things. 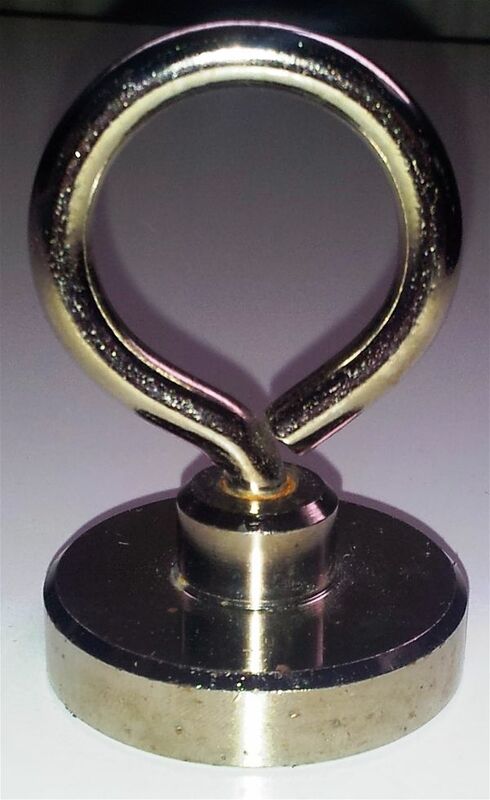 Therefore, I highly advise you to buy a strong magnet even though it is your first one. Just remember, that to be able to use the magnet for magnet fishing, it should have a hole or an eye. Where to buy large magnets in the U.S. This one is able to lift approximately 110 kg / 242 lbs and weighs 270 grams. For tips and tricks when you go magnet fishing, visit this page. Depending on the magnet you have you need some rope. First time I was fishing with small magnets I used fishing line which had a tensile / breaking strength of 6 kg. But if you have a 110 kg strong magnet, a fishing line is useless in the fight of a heavy object, unless it is a really strong line!!! The black and orange rope you see is Paracord. It is a nylon rope used for parachuting. It has a minimum tensile / breaking strength of 550 lbs ~ 250 kg. It has a core of 7 strands which makes it extremely strong and durable. I bought 2 x 100 ft. As you can see i have divided the orange rope into 2 x 50 ft because I often fish in shallow waters. The colors doesn't matter at all, but i think the orange rope is easier to find if it breaks at you have to dive into the water to retrieve your magnet. This braided Honeywell Spectra line has a tensile strength of more than a 1000 lb, almost no stretch and is UV resistant. It is actually designed for spearguns so it is made for water and is cut and abrasion resistant as well. This Paracord is 300 lb stronger than the normal Paracord and is made by an US government certified contractor. Paracord has a low weight compared to its high strength. At the same time the rope cannot rot, which means it is perfect for use in water. This very strong climbing rope is designed to hold people up to 300 kg / 660 lbs and has a tensile strength of 15 KN which is equal to more than 3 million pounds. The rope is thicker than the other two, and you will therefore have a better grip on your rope when pulling up heavy treasures. BEWARE some people on the subreddit, magnet fishing, says, that you should not use paracord at all. To that, I disagree. They say it doesn't hold, because the knots make the rope weak. I have used paracord for magnet fishing in more than three years now, and I have NEVER broken the paracord. You can be unlucky with any rope you buy. If you do not want to use paracord, I suggest you go with the climbing rope. So the 110 kg strong magnet is fine. But the setup / rig was just not strong enough to use for magnet fishing. Yeah, I have caught a lot of funny stuff, but I have struggled and lost lots of heavy thing the many times I have been going out to magnet fish. Therefore I decided to try and make a stronger rig, which would enable me to get heavier things up from the bottom of the lakes. I bought and Ikea frying pan made from aluminium and stainless steel. The I bought three counter sunk magnets, 3 bolts and 3 lifting eyes with a thread which suited the bolts. Then I drilled the holes and placed the magnet. Shortened the bolts, put them through, and attached the lifting eyes. And then I was done. I decided to leave the handle on, since I can use it to throw out the magnet fishing rig, and grab the handle, when something heavy comes up attached to the pan. Below, you can see pictures of my rig, hope you enjoy it.